This topic came up on one of my favourite game development communities, r/gamedev and I thought I should make a quick tutorial on setting up Libgdx for someone new in game development, so you don't have to worry. Give it a name, and click finish. Right click on the project folder on the left hand screen. In the right-click dialogue, go into New > Folder. Give it the name "assets"
Do this again, and create a "libs". You can call them whatever you wish, it's just what i like to use. Assets is for images and such, libs will store the LibGDX jars. 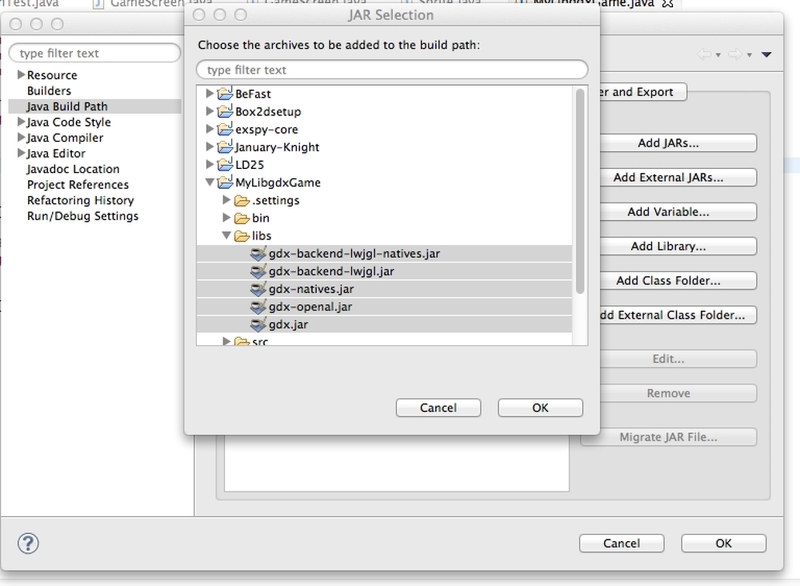 Copy the .jar files, and put them into the libs directory in your java project folder. Click refresh so the folders get updated with the Jar files. In the now open window, click Add Jars on the right. Shift click all the jar files in the folder. Now that you have all the necessary binaries, time to create a simple window to start. Add a new class to the src package. Be sure to name it the same as the project, as it's where we'll add the main method. At this point you can build the game and a window will pop up. But it will flicker and such, which is not what we want. So what you can do now is add a new class. Add an interface to it in the creation wizard. The interface is called Screen and is part of com.badlogic.gdx package. This class creates a lot of nice functionality for us to manage a game screen. You can use the screen interface for different states of the game. Such as menus, intro, game over, etc. It gives you initialization, a render method, pause, and other handy methods. Put those in the create method, and try running the application. That's your basis on getting an application setup for libgdx. Definitely check out their documentation on how to use the framework. Just remember to start simple. Even just do some movement with shapes and such!